Italy has a bounty of jewel-like cities – small-sized, liveable and packed with beautiful buildings. They make excellent places to buy a home, offering easy holidaymaking and superb rental returns, says Fleur Kinson. As if it weren’t enough to have heart-meltingly lovely countryside, celestial mountains and a glorious coastline, Italy also manages to squeeze in an abundance of arrestingly beautiful cities. Well-known gems such as Venice and Florence are only the beginning. Explore any part of Italy and you’ll come across countless charmers. Bologna, Trieste, Perugia, Orvieto, Brindisi… There are too many to mention. Some are increasingly familiar to foreign visitors, some deserve to be much more so. In a nutshell, Italy gets cities right. They almost always have a well-preserved historic centre, where narrow ancient lanes meander between handsome old buildings and grand piazzas. Being many centuries old, most Italian cities were designed for people not cars, and this still lends a ‘person proportion’ to their centres. Dominated by strollers on foot rather than motor vehicles, the pace of streetlife is slower and less stressful. There’s time to stop and chat, or sit and watch the world go by. Crucially, Italian cities tend to be on the small side, which keeps them knowable and intimate, and fosters a strong sense of local identity. Only two Italian cities have a population of more than one million people (Rome and Milan), and only two others get above the 900,000 mark (Turin and Naples). The rest have far, far fewer people than that. Citizens are often strikingly loyal to their home-city, honouring its special traditions and festivals with gusto. Italian cities certainly see the same strong sense of community we italophiles admire so much in the country’s small towns and villages. They are the complete antithesis of alienating megalopolises where no one knows their neighbours. In Italy as everywhere else, urban properties are generally considered to be a wise investment. They gain value during good times and hold their value well during bad ones – usually being among the last property types to see any drop in price when a recession arrives. The reasons for this are obvious. There’s rarely a shortage of people looking to buy somewhere to live in a city, which protects re-sale values because sellers don’t struggle to find buyers. Furthermore, for reasons of space, there’s a limit on how many homes can ever be available in a city, so it’s unlikely that a sudden glut of new-built homes are going to drive down the price of existing ones. Thus, money invested in an urban home is usually very safely spent. Then, unless you intend to live in your property full-time, there’s the added bonus of rental returns. You can earn money on your investment whenever you’re not making use of the place yourself. The Italian cities in which you are most likely to want to buy a home all draw considerable numbers of tourists to whom you can offer holiday rentals, but they may also offer longer-term rental prospects from students or visiting businesspeople if you were interested in exploring those markets instead. For buyers hoping to rent to holidaymakers, cities can make an even better place to buy than more rural areas. Cities draw tourists year-round, while more rural locations tend to have a more restricted visitor season. You could expect a greater number of visitors throughout the year, and thus more rental revenue. Let’s take Venice as an example. One of Italy’s most expensive locales for property, Venice might ask €300,000-€450,000 for a two-bedroom apartment. But you could rent this out for €800-€1,000 a week, just about every week of the year. 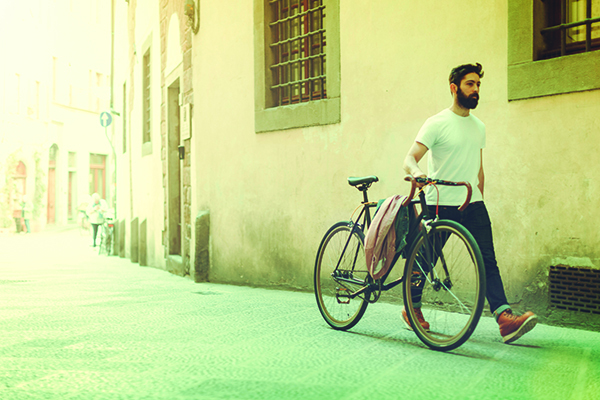 Investment aside, there are other good practical reasons to consider buying an urban apartment in Italy. A city property makes it much easier for you to take lots of little holidays than a house out in the country. You can fly direct to the city and soon be at your bolthole rather than spending an hour or two driving out into the wilds – making frequent short breaks much more viable. An urban home is also arguably a better way to become more quickly immersed in Italian life and the Italian way of doing things. With lots of people around, you’ll witness endless vignettes of Italian behaviour, and get rather more chances to practise your Italian than you might out in the countryside. 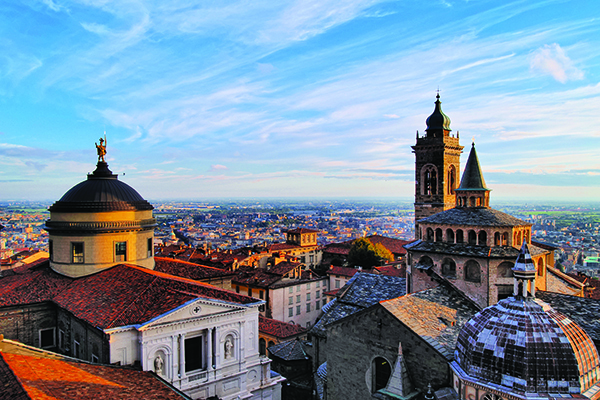 Famous to many just for its airport and proximity to Milan, Bergamo is a truly beguiling city in its own right. It’s easy to feel spoilt for choice when it comes to Italian cities. Unless you’re already smitten with a particular city and know that it’s the only one you want to buy in, it’s a good idea to consider your many options and do some research. A good starting point is size. Do you favour a large-ish, very well-known place such as behemoth Rome, slick Milan or vibrant Naples? Or are you more drawn to gem-like smaller cities such as sophisticated Trieste, otherworldly Perugia or gastro-wonderland Parma? As Italian cities have such distinct and disparate identities, with different climates, cuisines, dialects and atmospheres, it really pays to get to know what kind of places are available to you. There is a huge choice of intensely appealing cities in Italy, and if you haven’t travelled widely, do read up on a few. Some cities not yet mentioned in this article which it might also be worth you knowing more about are, in descending order of size: Palermo, Bologna, Bergamo, Vicenza, Ferrara, Ravenna, Brindisi and Pavia. If only there were space here to describe them all! There are three cities which deserve concentrated attention, however, by virtue of their popularity. The three Italian cities most loved by foreign buyers are, as you might have guessed, Venice, Florence and Rome. They’re also the same three cities most loved by foreign visitors, so their holiday rental prospects are very strong. 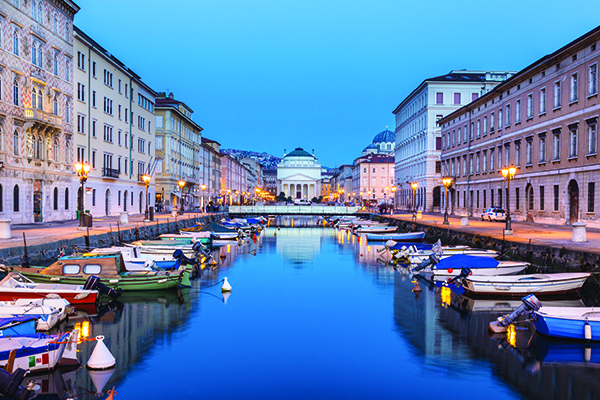 Trieste, in the far northeast, has a medieval old city and a neo-classical Austrian quarter. Venice is an endlessly bewitching place, whose exquisite buildings and watery streets lend it a dream-like, fantastical aspect. People fall for Venice in a big way, and, unfortunately, they have to spend big to be here. 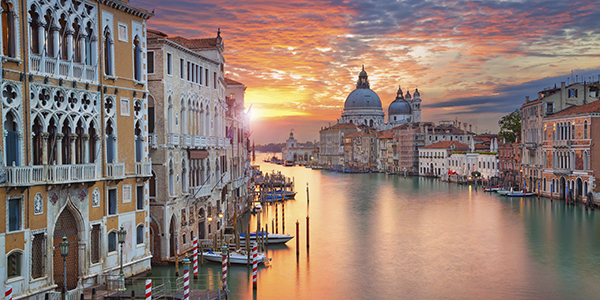 Venice’s property prices are among Italy’s highest. However, the city’s various districts are not equally costly. Anything in San Marco or anything with a view of the Grand Canal is going to be expensive. But appealing districts with lower prices include Dorsoduro, San Polo, Santa Croce, Cannaregio, Castello, Giudecca and Burano. As a very rough guide, you might get a studio or one-bedroom apartment in Venice for €200,000, a two-bed for €300,000-€450,000 and a three-bed for €400,000-€600,000. Features such as balconies, patios, terraces and views are very desirable and increase price. Florence, Tuscany’s sun-kissed cradle of the Renaissance, is slightly more affordable than Venice, you might be pleased to hear. Prices here were a little more affected by the far-reaching repercussions of 2008’s international financial crisis, and have yet to rally significantly. That makes right now a very good time to buy, before prices start rising again. The advice is to go for somewhere in the historic centre of the city, on one of the higher floors in any building – to give yourself romantic rooftop views and to escape the noise of the street. Choose a place that needs a bit of refurbishing inside if you want to get the most value for money. Buyers hoping to attract rental clientele should note that two- and three-bedroom apartments are more profitable than studio or one-bedroom places. As in every city, the presence of some sort of outdoor space – a balcony, patio or terrace – adds to an apartment’s rentability. Then there’s Rome. This is Italy’s biggest city by a very long way, with nearly three million people calling the place home. It’s a bold, confident place, with property prices to match. Rome can be even more expensive than Venice, but you might consider buying on the city outskirts to save money (just make sure the transport connections into the centre are very good if you want to offer rentals). The lovely Olgiata district far outside the centre would be a good one to consider. Meanwhile, back in the heart of things, good-value districts include Testaccio, Trastevere and Borgo Pio. 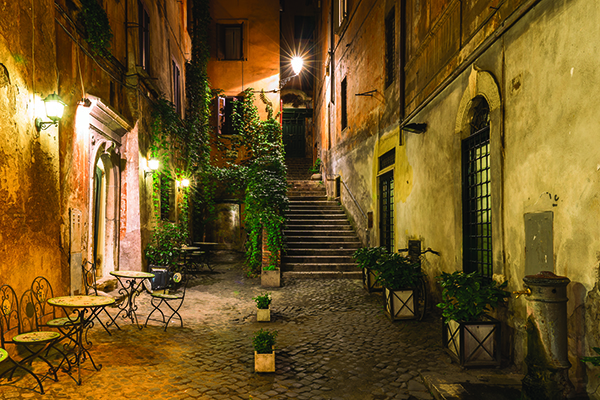 Rome boasts many secluded corners. Whichever Italian city you choose, if you’re looking to buy a place somewhere in the centre, chances are that you’ll be looking at an apartment rather than an actual house. Note that Italian apartments tend to be extremely well-built. A big concern about sharing a building with other people is noise, and Italian apartments factor this into their construction. If the building is centuries-old, thick stone walls usually keep out most neighbourly noises. If it’s modern-built, special sound-minimising materials and design are likely to have been employed. City apartments have one big advantage over that perennially-popular property type, the old country farmhouse, in that you’re unlikely to be buying one that’s dilapidated. Sure, you might want to make minor repairs or update the décor before you start using the place, but the building is likely to be in a very good state of repair generally. And once you’re in there, you’ll always be spending less on maintenance and upkeep than the average buyer of an old country home. Maintenance costs for the whole building are always split between all the owners of apartments inside. A pre-set annual charge, the spese del condominio, is paid by all apartment-owners in a building to cover the cleaning and upkeep of all shared spaces. Always enquire what your spese del condominio will be before you buy.